If you need to repair your credit you want results and you want them fast. You might be willing to pay a small amount to get those results but you don’t want to waste your time or money. I get it. There are hundreds of companies out there that make big credit repair promises but most are just scam artists that don’t deliver. Lexington Law is a law firm that dominates the credit repair space. But just because they are huge doesn’t prove they are worth working with. Are they just another marketing slickster? Can they really help you increase your credit score in a way that sticks or are they just a disappointment? I wanted to find out for myself so I went through their website with a fine-tooth comb. As the name suggests Lexington Law is a true law firm. It was formed in 1991 by a group of attorneys in Salt Lake City. To me that seemed like it was a good start compared to the uneducated sales sharks that populate this industry. Because Lexingtonlaw has been around for more than 20 years and because they are a law firm I figured they should know their way around the credit laws. We’ll get back to that shortly. Ever since their humble beginnings they’ve thrived. Back in 1991 they started off occupying a small office in Salt Lake. Now they have offices in 20 states and work in all 50. That got my attention because rotten apples don’t usually last long in this industry. One of the reasons for that is the government combs this industry all the time looking for fraudsters. When they find those bad boys they kick them out of business. Yet Lexington has doubled its size many times over. Credit Fact: 56 companies were shut down after the government went after credit repair fraudsters both in February 2006 (Project Credit Repair) and in October 2008 (Operation Clean Sweep). This is in addition to the government’s continual auditing of this business industry. The fact that Lexington survived and thrived says something about this organization. Of course it doesn’t necessarily mean that Lexingtonlaw does a good job for clients – we’ll look at that shortly. But you have to be impressed by their growth. Does Lexington Law comply with Federal Trade Commission standards? Before determining if the company can help you improve your credit score, I wanted to review its regulatory history and compliance. I focused on the Federal Trade Commission’s (FTC) suggestions and warnings regarding how to select a good credit repair company. As I read through those recommendations, it looks like Lexington Law is consistent with those standards. Beware of companies that charge in advance. Lexington Law doesn’t do that. Beware of services that don’t disclose your rights. Lexington is transparent about your rights. When I spoke to the company they told me that Lexington Law is 20 times larger than their nearest competitor. Also, they sign up over 2000 people every day on average. It would be silly for a company this successful to break the rules and thereby jeopardize that success. Beware of credit repair firms that suggest you create a new identity like applying for a new tax ID number to replace your Social Security number. That’s a crime and Lexington doesn’t play that game. Be careful of firms that exaggerate their expertise. I didn’t find this to be the case with LexingtonLaw. In fact when I reviewed their roster of attorneys I was really impressed. Beware of firms that claim to be endorsed by the FTC. Lexington doesn’t. They do have an A rating with the BBB but they don’t claim to be FTC endorsed. Honesty is the best policy Pilgrim. The fact that Lexington thrived while others were shut down by the government gave me enough comfort to want to learn more. When I discovered that they work in all 50 states, have offices in 20 states and that they’ve helped over 500,000 people since they started, that really got my attention. I also sat up in my chair when I discovered that on average, their clients got 10.2 items removed from their credit history. That represents, on average, 27% of their negatives. 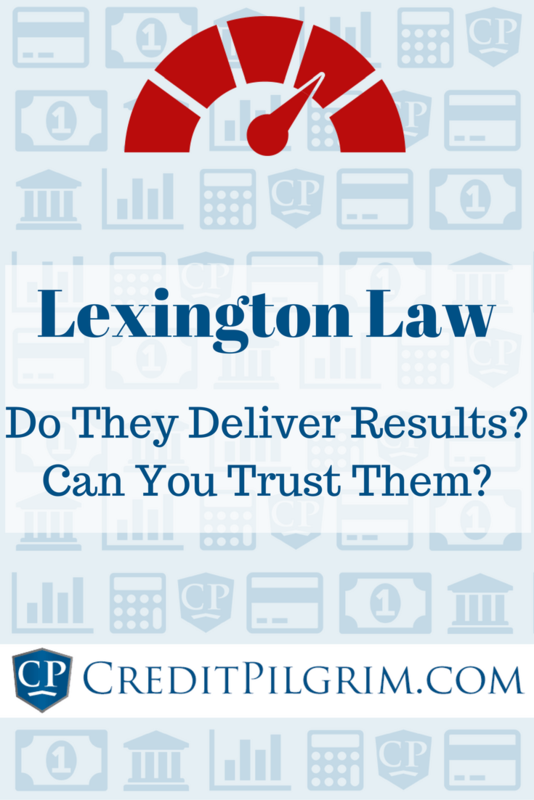 Even better, Lexington Law got those results in 4 months or less – again on average. That made me stop and think. Can you imagine what your credit score would look like if you had almost a third of the negatives erased? Can you imagine how helpful that would be? Of course Lexington Law can’t guarantee those results but those averages looked very good to me. I like those statistics. What Kinds of Credit Problems can Lexington Law Help With? How Does Lexington Law Get Rid of Negative Credit Items? Keep in mind that 20% of all credit reports contain errors according to the most recent government audit. That creates a lot of opportunity to get negatives erased off your report. Right? According to the law, the data on your credit report must be both “accurate and verifiable”. The “Fair Credit Reporting Act” gives you the legal right to demand that the credit bureau investigate any item you feel is inaccurate, untimely, misleading biased, incomplete or unverified as I said above. If the reporting bureau can’t verify the accuracy, they must correct or delete the item from your credit report by law. That is how Lexington Law works its credit magic. Obviously, if an item isn’t accurate it gets wiped. And even if an item is technically accurate, it has to be taken off your credit report if it doesn’t tell the whole story because of your unique circumstances. And if the vendor reporting the negative is unable or unwilling to verify the charge in a timely manner, it also has to be cleaned off your credit report. This happens a lot more than you think. Companies close down and are sold all the time. Others are sometimes unwilling to take the time to do the research and verify the debt. If you come up against any of these circumstances, the credit bureau has to clean those negatives off your report. As I said, Lexington Law also works directly with your creditors. Sometimes, the lawyers are able to get the creditor to remove the item just by asking. When your creditor gets a letter from a lawyer, they often move faster and become more friendly and flexible than if they get a letter from you or me. If the “Mr. Nice Guy” approach doesn’t bear fruit, LexingtonLaw uses the consumer protection laws to force creditors and collections agencies to either prove the negative item was reported in a lawful manner or remove it. What is the Process of Cleaning Up your Credit with LexingtonLaw? I called Lexington to ask my questions and I never felt pressure to hire them. I felt reassured by that. The initial consultation is free and during that call, the representative will review how much you owe, how much credit you have available and whether you filed for bankruptcy in the past. Then they will review your credit report and build a comprehensive repair plan. Note that the plan usually requires several months to implement in full. But within 5 days of signing up, the pros at Lexington Law spring into gear. They contact the credit bureaus and creditors with challenge letters to begin the credit scrubbing process. Most people who sign up with Lexington Law have negative items that need to be removed and that’s fine. But those same people can also add significant points to their score by doing a complete credit score analysis and being proactive about adding positives to their credit history as well. When you become a Lexington Law client, you usually get this coaching and direction included for free depending on what service level you sign up for. More on that soon; let’s get back to the fixing process. The experts at Lexington Law go through all three of your credit reports and list the negative items that bring your score down. These are listed in order of how negatively they impact your credit with those having the greatest negative impact on top. Then you go through the list together line by line and, together with your case manager, you decide which items make most sense to dispute. Once you do that, Lexington sends out more intervention or dispute letters. This forces the credit bureaus to start their investigation. Once the bureaus dig into the dispute and makes a decision, they’ll send you another credit report which shows how they’ve handled the issue. They have to get back to you within 30 days according to the law. If you don’t get the result you were looking for, you simply send Lexington Law the new credit report and they can continue disputing the item and take it up a notch. Lexington uses escalated account investigations, goodwill investigations and requests to validate the debt. These tactics are focused on the creditor rather than credit bureaus and the goal is to get faster and better results. It just gives them more targets to shot at if you get the intended result. Remember, in order for a negative to stay on your credit report it has to be accurate, timely and verifiable and the bureau has to have proof of this. As I mentioned above, it’s often impossible for the credit bureau to prove the negative item because the creditor can’t or won’t verify the information. And remember, the bureaus have to complete their inquiry within 30 days. If they don’t do that, they have to remove the item. (The only downside to this is if the bureau later receives the verification, the item could show up on your credit report again). The open line of communication is another thing I really like about Lexington Law. They have a great website and an easy-to-use web application. You can log in whenever you want to see what progress you’ve made and where you stand. What I found especially cool was that you can see how your score increases as Lexington Law gets your report cleaned up. Neato. If you want to talk to your case manager, you have plenty of opportunity to do so. They can be reached 6 A.M to 10 P.M. and 7 A.M to 9 P.M. on Saturday (MT). The firm offers three pricing plans. No matter which package you choose, you’ll have to pay a one-time setup fee of $99. From then on the monthly fees vary. 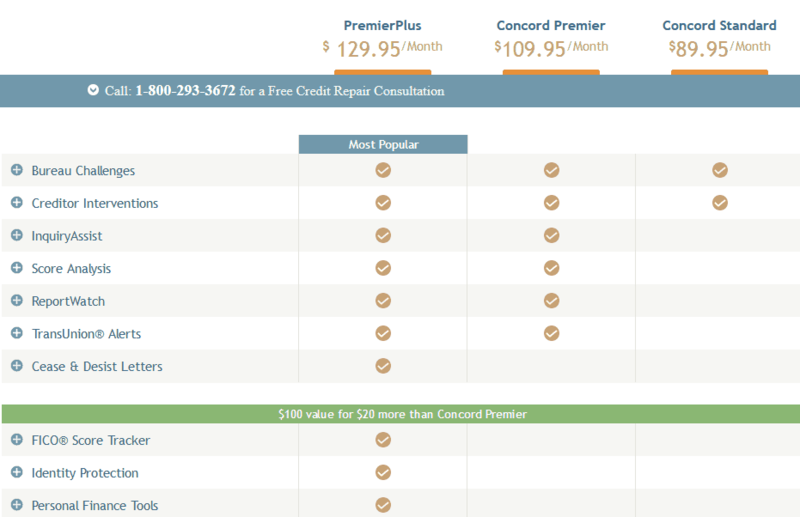 If you select their most basic service called Concord Standard, you’ll pay $89.95 a month. In this price plan they use the Fair Credit Reporting Act to get negatives removed from your credit report by contacting the credit bureaus and communicate with your creditors to protect your reports and scores. Their next level up is their Concord Premier. This gets Lexington’s team involved with both the credit bureaus and your creditors. They also expand their use of the law by arguing the Fair Credit Billing Act (that gives you the right to get detailed information about your billing and account history), the Truth in Lending Act (that law spells out how credit accounts are supposed to be opened) and the Fair Debt Collection Practices Act (this talks about your rights once a bill has been moved over to collections). You also get legal tools at your hand to deal with creditors in cases of unfair credit score damage created when creditors checked your credit reports. The highest service level is the PremierPlus and is very useful but it is necessary if you deal with abusive debt collectors and you want help in that front. In addition this package provides credit score monitoring, identity theft protection and various tools to better manage and control your finances. The only thing I didn’t really like was the service options menu and I’ll tell you why. In order to do a thorough job repairing your credit, you need to go all the way. That includes getting tough with creditors and that’s not available in the regular service. I called Lexington Law on this and they explained that when people start out they usually go with the Premier Plus plan and work their way down over time because they don’t need the heavy artillery after a while. It’s cool that the service is designed to get cheaper for the consumer over time. But I wish that was spelled out. First off, I really think it’s powerful that these guys are a law firm. As I said, there is something about getting a letter from a lawyer that makes your creditor suddenly want to make the problem go away. Lexington Law provides that powerful arrow in your quiver. I also think it’s important that Lexingtonlaw has been around for more than 20 years. That indicates that they know the law and they have personal contacts at the credit bureaus and large creditors. I know from my own experience that having friends on the other side of the table can make all the difference. And like I said, Lexington thrived during a period when government scrutiny forced many of the competitors out of business. That tells me they have a clean business and one that serves its clients. I like the fact that they’ve removed millions of credit negatives and that’s what’s most important. Based on everything I read, I believe that if you are patient, willing to slowly remove negative items, and take advantage of their credit training, you can significantly boost your credit score in a matter of months. Bottom line. Lexington Law has been remarkably successful using these techniques getting negatives removed. That’s not a guarantee of course. But with so much to gain by increasing your credit score, I think it’s a no-brainer to give them a try.